The book is a map through every step of the recovery process. It details the first hours, days and weeks after traumatic injury; it defines the injury and outlines basic medical care now and in the future. In easy-to-understand language, the book offers detail on the complex medical and psychological issues that define spinal cord injury. While it was specifically created for people living in Southern California, it is a valuable resource to anyone new to spinal cord injury. Topics include: “Emergency Care,” “Choosing a Rehab,” “Spinal Cord Injury in Children,” “Body and Mind,” “Caregiving,” “Getting Mobile,” “Your Legal Rights,” “Research and Recovery,” and an extensive “Resources” section. 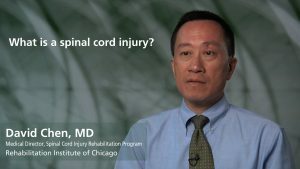 Watch David Chen, MD, define a spinal cord injury. It also give in depth information on insurance coverage, rehabilitation best practices, self-care and coping strategies, expected outcomes, assistive technology and equipment, home modification, and the steps needed to return to the community. It offers an overview of legal rights, and legal options in the event an injury may have been caused by someone else. The book was written by Planet SCI dweller, Sam Maddox, the creator of Spinal Network, New Mobility, the Hub of SoCal, and the widely-distributed Paralysis Resource Guide (from the Christopher & Dana Reeve Foundation). He doesn’t try to sugarcoat the reality of a spinal cord injury, and hopes that that the book will give people new to SCI the tools to make more informed choices. “SCI trauma is complicated,” Maddox said. “Obviously, the more you know about what’s going on the better – you can’t make good choices if you’re in the dark. Click here to download SCI: The First 90 Days for free.